That's some pretty majestic music. 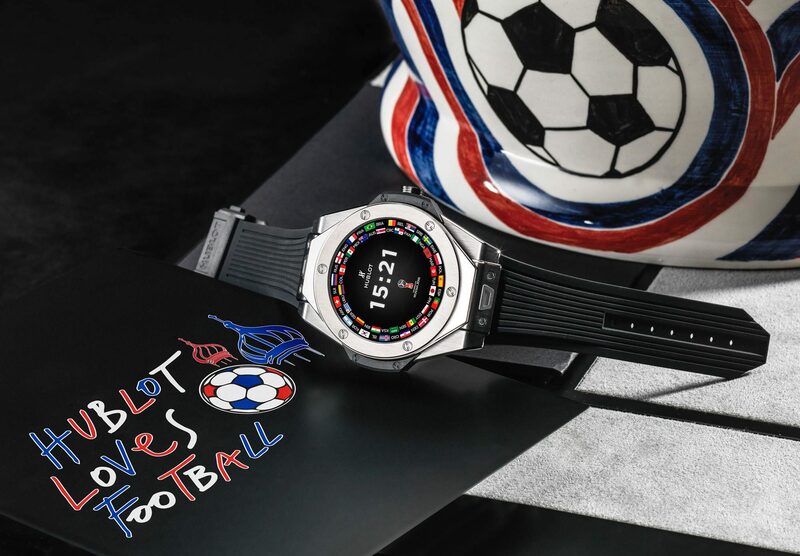 As you'd expect from a $5,200 smartwatch, the Big Bang Referee 2018 FIFA World Cup Russia (henceforth referred to as 'BBR2018FWCR') is pretty well-equipped. It sports a 400x400 AMOLED display, a 1.6GHz Intel Atom Z34XX, 512MB of RAM, a 410mAh battery, NFC, GPS, as well as the usual bevy of sensors (accelerometer, gyroscope, and tilt detector). Water resistance comes in at 5 ATM, or 50m deep. Hublot says the battery will last a very ambitious one day, and the charger is said to be of the standard contact variety. But of course, you're not paying $5,200 because it has a big battery or an Atom chip; you're paying for the design and the rarity. The BBR2018FWCR's chunky 13.9mm-thick case and bezel are both titanium with a satin finish, it has a Kevlar insert, and the face is adorned with 6 H-shaped screws (which is apparently supposed to be impressive). Two 'One Click' straps are included: a sponge cuff strap with the 2018 World Cup and Hublot emblems and a black rubber strap. 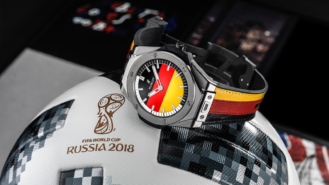 Hublot's wording is a little unclear, but it seems like a third leather strap in the colors of each customer's country will also be thrown in. Watch straps for German and Russian customers. 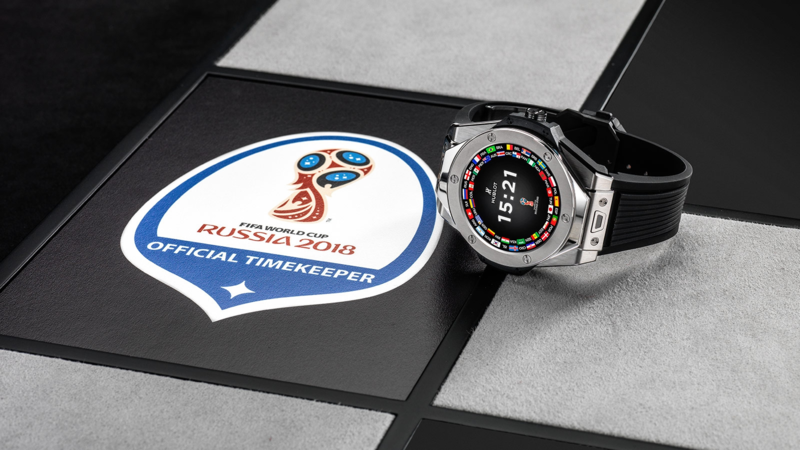 Each referee's watch will use goal-line technology, which is described as "an electronic video assistance system for refereeing which follows all the trajectories of the ball and determines for certain if the ball did or did not entirely cross the goal line." Other software features include 32 "fan" dials in the colors of each participating nation (as seen above) and match announcements 15 minutes before their kick-offs. 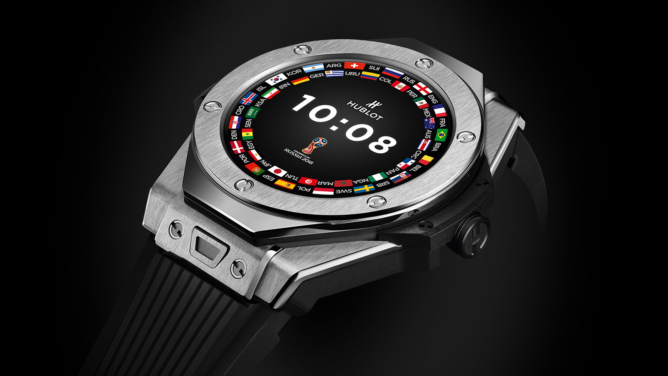 The watch will also push notifications for yellow cards, red cards, player changes, and goals. Whenever a goal is made, the BBR2018FWCR will vibrate and display "GOAL" on its screen, which could get annoying after a while. The screen will also show stats such as the score, number of cards, goal-scorers' names, substitutions, and match time during each match. If you want a BBR2018FWCR (how could you not? 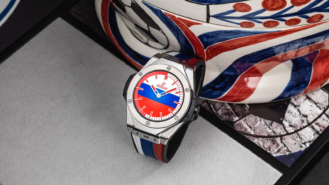 ), it'll be available in Hublot sales outlets globally on May 1st. Only the Swiss pricing of 5,000 francs was given, but that translates to $5,200 USD. Only 2,018 pieces will be available.